There appears to be a lot of confusion regarding Punjabi and Gurmukhi. People make the assumption that there is a language called Punjabi (what we use everyday) and there is the language called Gurmukhi - the language used to write the Guru Granth Sahib. So are there two languages?? Did the Guru's use different language called Gurmukhi?? The answer is No. It would be more accurate to say one speak's Punjabi and read's or write's Gurmukhi. Remember - Punjabi is language (what we speak). Gurmukhi is a script (how we write Punjabi). Punjabi (Gurmukhi: ਪੰਜਾਬੀ; Devanagari: पंजाबी; Shahmukhi: پنجابی) is an Indo-Aryan language spoken by 102 million native speakers worldwide, making it the 9th most widely spoken language (2010) in the world. It is the native language of the Punjabi people who inhabit the historical Punjab region of Pakistan and India. 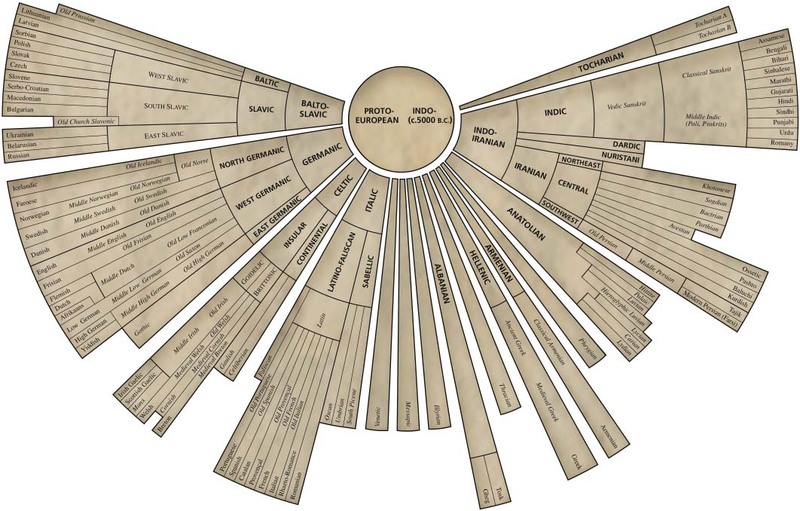 It is the only tonal language among the Indo-Aryan languages. Punjabi is an Indian language, which belongs to the outer-circle of the Indo-Aryan languages and distantly related English being a member of the same Indo-European language family. It is a modern Indo-Aryan language spoken mainly in the Punjab states of both India and Pakistan. It nearly resembles Hindi and Urdu. There are 2 main scripts used, Punjabi-speaking Muslims may write Punjabi in the Perso-Arabic script (as used to write Urdu, writing from right to left), this sometimes is referred to as Shahmukhi. (I will try to get examples of this, if you have any please send to me). Punjabi is also written using Urdu and Hindi scripts. Punjabi speaking Sikhs write Punjabi in the Gurmukhi script, which was developed by Guru Angad Sahib Ji. Contrary to another popular belief, Guru Ji did not invent Gurmukhi from scratch; he modified the Landa (lahnda) script. He and polished the landa script to reflect, pronunciation and the authentic tonal expressions to what is known as Gurmukhi today. The Landa had been around for centuries before the Guru Ji's. 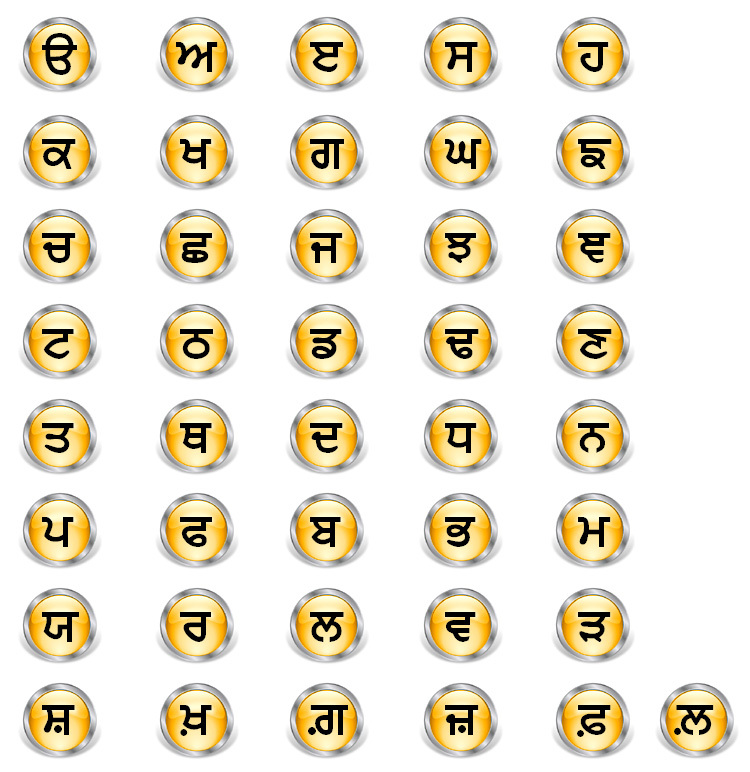 Gurmukhi is the most common script used for writing the Punjabi language in India. Gurmukhi was standardised by the second Sikh guru, Sri Guru Angad Sahib Ji, in the 16th century. The whole of the Guru Granth Sahib's 1430 pages are written in this script. The name Gurmukhi is derived from the Old Punjabi term "gurumukhī", meaning "from the mouth of the Guru". Gurmukhi is primarily used in the Punjab state of India where it is the sole official script for all official and judicial purposes. The script is also widely used in the Indian states of Haryana, Himachal Pradesh, Jammu and the national capital of Delhi, with Punjabi being one of the official languages in these states. Gurmukhi has been adapted to write other languages, such as Braj Bhasha, Khariboli (and other Hindustani dialects), Sanskrit and Sindhi. Gurmukhi script is the most complete and accurate way to represent Punjabi sounds. Unlike Roman script, the Gurmukhi script follows a 'one sound-one symbol' principle. The Gurmukhi script has forty one letters including thirty eight consonants and three basic vowel sign bearers. There are ten clear vowel signs and three auxiliary signs. The most striking characteristic of the Gurmukhi script, in comparison with Roman, is that, with the exception of five, all letters are joined by a line across the top. Like English and other European, Latin-based languages, it is written and read from left to right. However, there are neither capital letters in Gurmukhi nor articles such as 'a' and 'the'. Punjabi spellings are, for the most part, regular and relatively simple to learn, though you may come across variations in spellings of some words. However, as is the case in English, Punjabi spellings are not fully standardized. Equivalent sounds which have been given in romanised script are only approximate since the Gurmukhi script has many sounds unfamiliar to the English speaker which often may not be exactly represented by the Roman alphabet. • There is no concept of upper or lower case letters. • The Gurmukhi script, unlike the Greek and Roman alphabets, is arranged in a logical fashion: vowels first, then consonants (Gutturals, Palatals, Cerebrals, Dentals, Labials) and semi-vowels. • This is a syllabic script in which all consonants have an inherent vowel. Diacritics, which can appear above, below, before or after the consonant they belong to, are used to change the inherent vowel. • When the Gurmukhi letters appear in the beginning of a syllable, vowels are written as independent letters. • When certain consonants occur together, special conjunct symbols are used which combine the essential parts of each letter. According to Linguistic Department of Punjabi University, Patiala there are the following dialects of the Punjabi language. Land between the rivers of Beas and Satluj is called Doaba. Do Aaba literally means "the land between two waters" in Persian. It includes Jalandhar, Hoshiarpur. 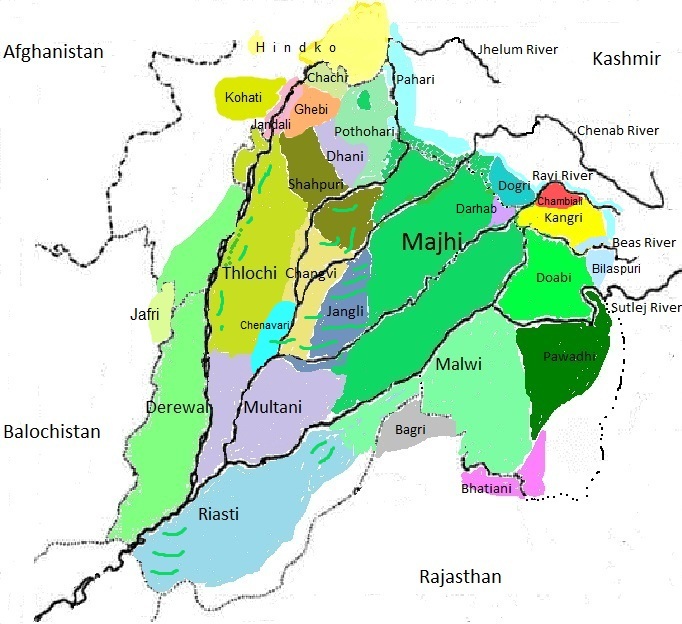 The region where Jhangvi is spoken stretches from Khanewal to Jhang and includes the cities of Faisalabad, Chiniot. Jhangvi dialect is also called the "Jangli" dialect of Punjabi. A Map of Punjab with locations of Punjabi Dialects.